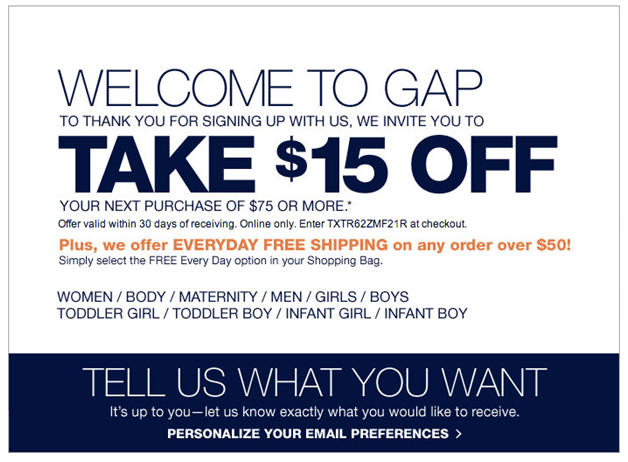 Here is the first email in a Welcome series from Gap. Everyone seems to agree that email marketing automation is the future. As such, automation platforms have become quite hot. What’s not to love about the idea of marketing automation? Driving more sales, measuring the impact, tightly managing the funnel — it’s the Holy Grail. But is it that easy? Yes and No. These days, everybody is running out of time. It seems like there is never any time to stop doing the regular tasks and put in some actual thought into what we’re doing. As a result of all the work we’re left to figure out ways to hack our schedules. We look for ways to make things more efficient. We look to implement processes and systems that will take care of the repetitive parts of life. Bill Gates has a famous quote about finding time hacks. The quote makes you laugh at first because it almost promotes laziness on the surface, but after thinking deeper about the quote you realize that the concept makes a lot of sense. Lazy people are driven to figure out ways to make their lives easier. Lazy people might actually be more driven to figure out how to automate their lives than the rest of us. Well it’s time to learn from those lazy marketers and figure out how to automate our marketing activities. Here are three of the ways you can automate your email marketing program to not only save you time, but make your program perform better. 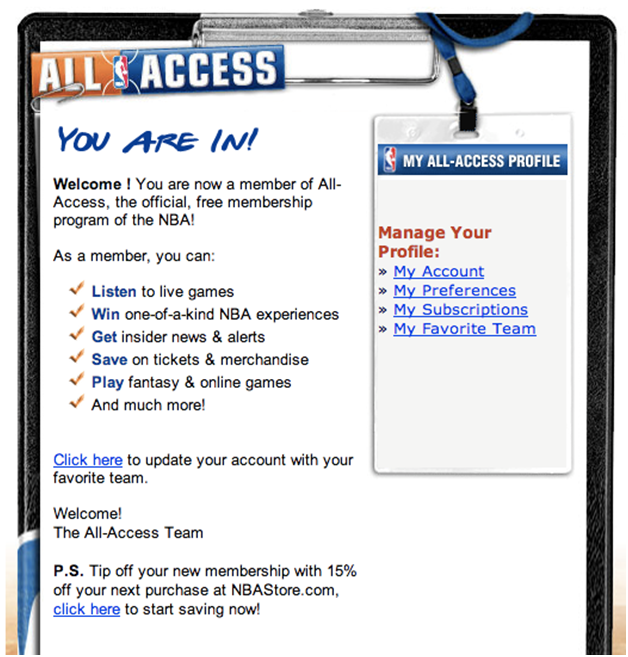 The NBA sends out a first email in their Welcome series that offers lots of content. When we sign up for an email list we expect to receive something right away. Even a few seconds will make us forget about signing up and we’re on to the next thing to occupy our attention. Believe it or not, there are well-known email marketing programs out there that don’t send a welcome series of emails to new subscribers. The new signup is put into the regular segment of subscribers and the first email they receive is the next marketing email in the queue. This is an issue because not only is the person left feeling unimportant, but there is money being left on the table as well. Automated email marketing allows marketers to create a welcome series to give instant gratification to new subscribers. The regular email process involves designers and marketers getting together to create an email plan. The team comes up with a calendar of email ideas and concepts. The designers create the emails. The marketers make comments and approve the email. The emails are sent out every week or every few days to the subscribers. With a welcome series you can create custom email templates that will be used again and again. You can put in the work up front to create emails that provide interesting content for new subscribers. It could be the story of your company or maybe you include an offer right away. Either way you’ll be providing instant gratification to the new subscriber by getting them an email right away instead of waiting for the next marketing email in the queue. All B2B salespeople and marketers know the sales funnel. Folks in sales are constantly working on getting people through the funnel. The first goal is to eventually convert new folks in the funnel to customers. But early on in the funnel it’s necessary to add some marketing to the mix to educate and qualify the lead and get them turned into a legitimate prospect. This is where automation can come in once again. Salespeople can be working a large number of leads at a time and it can be difficult to keep track of all the information. By creating a lead nurturing program the sales and marketing teams can automate the process giving them more time to handle more leads or to better focus on converting leads. Say for example a person contacts a B2B business. They ask for information. In a typical situation a salesperson would be assigned and would handle all communication with calls and emails. After a conversation on the phone it becomes obvious that the person is at the early stages of the funnel. They need to be convinced about the basic concepts. 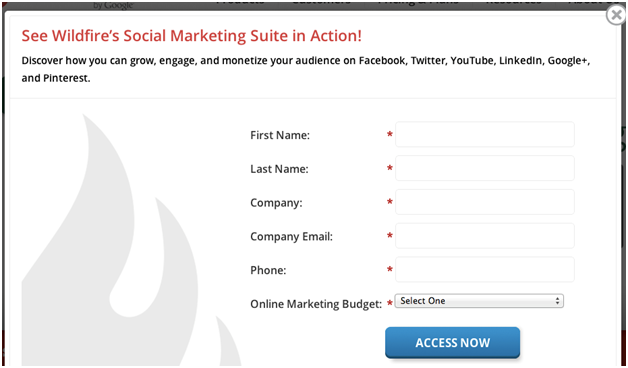 Enter a lead nurturing series. The salesperson can sign the person up for a series of emails that offers something like presentations or videos or whitepapers on general topics. As the person learns more about the concepts they can once again be directed, based on their actions and level of engagement, to setup a call with the salesperson. The process saves time and creates better prospects. 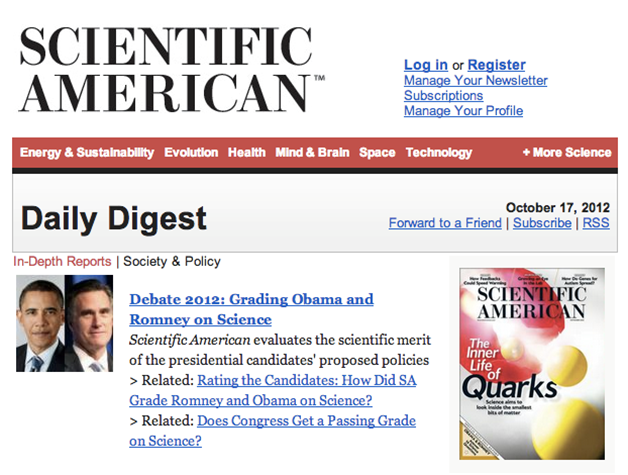 Most digest style emails are automated like this one from Scientific American. From time to time the regular email marketing routine can get kind of boring. Not only can you get bored in the office with your emails, but your subscribers get bored too. To boost response, something to try is to create a promotional series of emails for a specific segment of subscribers. Let’s take, for example, the people on your list that have opened emails in the last three months, but have not clicked through to your website. Work with your team to create a series of emails designed to get these people to click. For some reason they’re opening your emails, but not clicking. Maybe they’re interested in the subject line, but aren’t interested in the content. Maybe they have a preview option on their email inbox. The series can be something that builds up over time. You could create a three part series that introduces new content on your website with each email. If the program works you can use it again and again for the segment of customers that open, but don’t click on your emails. Sometimes it pays to be lazy (physically, not mentally). While email marketing automation can undoubtedly deliver tremendous value; technology is only part of the solution. Truth is, automated email marketing is initially more difficult for marketers compared to standalone campaigns. For marketing automation to deliver on the promised results, companies must work harder at developing processes that can turn this idea into an effective reality. That is, although it requires less production it requires much more planning and testing. When it comes to email marketing it can pay to automate. There are a countless of ways to automate your email program. Hopefully the three ways above will help get you started. Start saving time today with automated email marketing. It can save you time and earn you more revenue. It’s a true win-win for online marketers and their readers, customers and prospects. About the Author: Scott Hardigree is founder of Indiemark, and email marketing agency. He can be reached everywhere here. Good tips, many marketers miss out on automating their messages and combining them with their regular messages to have maximum impact on their revenue. Never thought as automated email being a time conserver. Here at KobeMail we see it as a standard for every client we have as we know how important it is to contact signups immediately for better engagement, but it is a good point well made none the less. Automated emails save time and are very effective.